Tonight's movie, Schramm, was mercifully short. I say that for two reasons. First, I'm reaching the point in the month where it's getting really, really hard to stay up this late every night. Second, it was such a strangely upsetting movie that 65 minutes is about all I could have taken. This was one of the movies recommended to me when I polled my Facebook friends for things to include in this year's project. I hadn't heard of it before, but that actually attracted me to it even more. All three of the movies that I've watched so far in the Deep End block have had one thing in common. They have all finally shown me where my boundary is. There's a lot of things that I can handle watching onscreen, but dental trauma just is not one of them, and so far, each of these movies has given me a good strong eyeful of bad things happening to people's teeth. It's a little bit difficult to describe the plot of this movie, because it moves around a lot. It starts with the end of the story, and then flashes back to different parts of the killer's life, not necessarily in sequence. 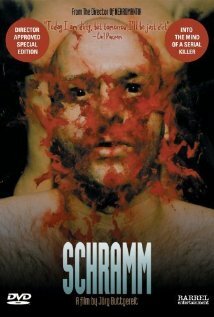 Schramm is a German film loosely based on the life of an actual serial killer. The main character, Lothar Schramm, is a cabbie who lives by himself. His neighbor in the next apartment is a beautiful prostitute who Schramm has strong feelings for. We see him fantasize a life with her where he is a sophisticated gentleman. He suffers from paranoid delusions, and the idea that unexplainable things are happening to his body, such as one of his legs being mysteriously amputated below the knee. When missionaries come to his door, he murders them in cold blood and poses them for his amusement. When he is trapped by self-loathing, he punishes his own body in a very memorable, very gruesome way. This could have been like so many other serial killer movies, but a few things set it apart. I felt like it made an attempt to go into Schramm's head. It's a twisted place, but it shows us what drives him. Second, it's a very moody film. More than being scared, there were many parts where I just felt like resting my head on my hands and sighing deeply, just from the melancholy of this movie. It's a strange, filthy look inside a crazy guy's head, but it succeeds. I give it four bottles of cognac out of five.